This article is about industrial uses of Cannabis. For recreational or medicinal marijuana, see Cannabis (drug). For other uses, see Hemp (disambiguation). The etymology is uncertain but there appears to be no common Proto-Indo-European source for the various forms of the word; the Greek term kánnabis is the oldest attested form, which may have been borrowed from an earlier Scythian or Thracian word. Then it appears to have been borrowed into Latin, and separately into Slavic and from there into Baltic, Finnish, and Germanic languages. Following Grimm’s law, the “k” would have changed to “h” with the first Germanic sound shift, after which it may have been adapted into the Old English form, hænep. However, this theory assumes that hemp was not widely spread among different societies until after it was already being used as a psychoactive drug, which Adams and Mallory (1997) believe to be unlikely based on archaeological evidence. Barber (1991) however, argued that the spread of the name “kannabis” was due to its historically more recent drug use, starting from the south, around Iran, whereas non-THC varieties of hemp are older and prehistoric. Another possible source of origin is Assyrian qunnabu, which was the name for a source of oil, fiber, and medicine in the 1st millennium BC. Cognates of hemp in other Germanic languages include Dutch hennep, Danish and Norwegian hamp, German Hanf, and Swedish hampa. Hemp is used to make a variety of commercial and industrial products including rope, textiles, clothing, shoes, food, paper, bioplastics, insulation, and biofuel. The bast fibers can be used to make textiles that are 100% hemp, but they are commonly blended with other fibers, such as flax, cotton or silk, as well as virgin and recycled polyester, to make woven fabrics for apparel and furnishings. The inner two fibers of the plant are more woody and typically have industrial applications, such as mulch, animal bedding and litter. When oxidized (often erroneously referred to as “drying”), hemp oil from the seeds becomes solid and can be used in the manufacture of oil-based paints, in creams as a moisturizing agent, for cooking, and in plastics. Hemp seeds have been used in bird feed mix as well. A survey in 2003 showed that more than 95% of hemp seed sold in the European Union was used in animal and bird feed. In 2011, the U.S. imported $11.5 million worth of hemp products, mostly driven by growth in the demand for hemp seed and hemp oil for use as ingredients in foods such as granola. In the UK, the Department for Environment, Food and Rural Affairs treats hemp as a purely non-food crop, but with proper licensing and proof of less than 0.2% THC concentration, hemp seeds can be imported for sowing or for sale as a food or food ingredient. In the U.S., imported hemp can be used legally in food products and, as of 2000[update], was typically sold in health food stores or through mail order. Hempseed’s amino acid profile is comparable to other sources of protein such as meat, milk, eggs and soy. Protein digestibility-corrected amino acid scores (PDCAAS), which attempt to measure the degree to which a food for humans is a “complete protein”, were 0.49–0.53 for whole hemp seed, 0.46–0.51 for hempseed meal, and 0.63–0.66 for hulled hempseed. Hemp oil oxidizes and turns rancid within a short period of time if not stored properly; its shelf life is extended when it is stored in a dark airtight container and refrigerated. Both light and heat can degrade hemp oil. Hemp fiber has been used extensively throughout history, with production climaxing soon after being introduced to the New World. For centuries, items ranging from rope, to fabrics, to industrial materials were made from hemp fiber. Hemp was also commonly used to make sail canvas. The word “canvas” is derived from the word cannabis. Pure hemp has a texture similar to linen. Because of its versatility for use in a variety of products, today hemp is used in a number of consumer goods, including clothing, shoes, accessories, dog collars, and home wares. For clothing, in some instances, hemp is mixed with lyocell. The first example of the use of hempcrete was in 1986 in France with the renovation of the Maison de la Turquie in Nogent-sur-Seine by the innovator Charles Rasetti. In the UK hemp lime was first used in 2000 for the construction of two test dwellings in Haverhill. Designed by Modece Architects, who pioneered hemp’s use in UK construction, the hemp houses were monitored in comparison with other standard dwellings by BRE. Completed in 2009, the Renewable House is one of the most technologically advanced made from hemp-based materials. The first US home made of hemp-based materials was completed in August 2010 in Asheville, North Carolina. Hemp is used as an internal plaster and is a mixture of hemp hurd (shive) mixed with larger proportions of a lime-based binder. Hemp plaster has insulative qualities. A mixture of fiberglass, hemp fiber, kenaf, and flax has been used since 2002 to make composite panels for automobiles. The choice of which bast fiber to use is primarily based on cost and availability. and the Mercedes C-Class both contain hemp (up to 20 kg in each car in the case of the latter). 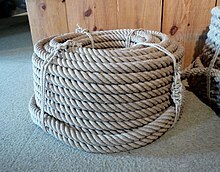 Hemp rope was used in the age of sailing ships, though the rope had to be protected by tarring, since hemp rope has a propensity for breaking from rot, as the capillary effect of the rope-woven fibers tended to hold liquid at the interior, while seeming dry from the outside. Tarring was a labor-intensive process, and earned sailors the nickname “Jack Tar“. Hemp rope was phased out when manila rope, which does not require tarring, became widely available. Manila is sometimes referred to as Manila hemp, but is not related to hemp; it is abacá, a species of banana. 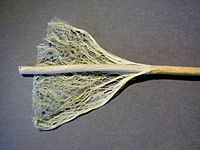 Hemp shives are the core of the stem, hemp hurds are broken parts of the core. In the EU, they are used for animal bedding (horses, for instance), or for horticultural mulch. Industrial hemp is much more profitable if both fibers and shives (or even seeds) can be used. Hemp can be used as a “mop crop” to clear impurities out of wastewater, such as sewage effluent, excessive phosphorus from chicken litter, or other unwanted substances or chemicals. Additionally, hemp is being used to clean contaminants at the Chernobyl nuclear disaster site, by way of a process which is known as phytoremediation—the process of clearing radioisotopes and a variety of other toxins from the soil, water, and air. Hemp crops are tall, have thick foliage, and can be planted densely, and thus can be grown as a smother crop to kill tough weeds. Using hemp this way can help farmers avoid the use of herbicides, gain organic certification, and gain the benefits of crop rotation. However, due to the plant’s rapid and dense growth characteristics, some jurisdictions consider hemp a prohibited and noxious weed, much like Scotch Broom. The dense growth of hemp helps kill weeds, even thistle. Biodiesel can be made from the oils in hemp seeds and stalks; this product is sometimes called “hempoline”. Alcohol fuel (ethanol or, less commonly, methanol) can be made by fermenting the whole plant. Production of vehicle fuel from hemp is very small. Commercial biodiesel and biogas is typically produced from cereals, coconuts, palmseeds, and cheaper raw materials like garbage, wastewater, dead plant and animal material, animal feces and kitchen waste. Separation of hurd and bast fiber is known as decortication. Traditionally, hemp stalks would be water-retted first before the fibers were beaten off the inner hurd by hand, a process known as scutching. As mechanical technology evolved, separating the fiber from the core was accomplished by crushing rollers and brush rollers, or by hammer-milling, wherein a mechanical hammer mechanism beats the hemp against a screen until hurd, smaller bast fibers, and dust fall through the screen. After the Marijuana Tax Act was implemented in 1938, the technology for separating the fibers from the core remained “frozen in time”. Recently, new high-speed kinematic decortication has come about, capable of separating hemp into three streams; bast fiber, hurd, and green microfiber. Only in 1997, did Ireland, parts of the Commonwealth and other countries begin to legally grow industrial hemp again. Iterations of the 1930s decorticator have been met with limited success, along with steam explosion and chemical processing known as thermomechanical pulping. The variety of appearances for cannabis. Only C. sativa (left) is suited for industrial hemp, but it also has medicinal varieties. Millennia of selective breeding have resulted in varieties that display a wide range of traits; e.g. suited for a particular environments/latitudes, producing different ratios and compositions of terpenoids and cannabinoids (CBD, THC, CBG, CBC, CBN…etc. ), fibre quality, oil/seed yield, etc. Hemp grown for fiber is planted closely, resulting in tall, slender plants with long fibers. In the United States, the public’s perception of hemp as marijuana has blocked hemp from becoming a useful crop and product,” in spite of its vital importance prior to World War II. Ideally, according to Britain’s Department for Environment, Food and Rural Affairs, the herb should be desiccated and harvested towards the end of flowering. This early cropping reduces the seed yield but improves the fiber yield and quality. In these strains of industrial hemp* the tetrahydrocannabinol (THC) content would have been very low. In contrast to cannabis for medical use, varieties grown for fiber and seed have less than 0.3% THC and are unsuitable for producing hashish and marijuana. Present in industrial hemp, cannabidiol is a major constituent among some 560 compounds found in hemp. Cannabis sativa L. subsp. sativa var. sativa is the variety grown for industrial use, while C. sativa subsp. indica generally has poor fiber quality and female buds from this variety are primarily used for recreational and medicinal purposes. The major differences between the two types of plants are the appearance, and the amount of Δ9–tetrahydrocannabinol (THC) secreted in a resinous mixture by epidermal hairs called glandular trichomes, although they can also be distinguished genetically. Oilseed and fiber varieties of Cannabis approved for industrial hemp production produce only minute amounts of this psychoactive drug, not enough for any physical or psychological effects. Typically, hemp contains below 0.3% THC, while cultivars of Cannabis grown for medicinal or recreational use can contain anywhere from 2% to over 20%. Smallholder plots are usually harvested by hand. The plants are cut at 2 to 3 cm above the soil and left on the ground to dry. Mechanical harvesting is now common, using specially adapted cutter-binders or simpler cutters. The cut hemp is laid in swathes to dry for up to four days. This was traditionally followed by retting, either water retting (the bundled hemp floats in water) or dew retting (the hemp remains on the ground and is affected by the moisture in dew, and by molds and bacterial action). 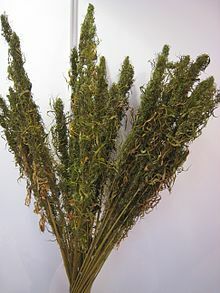 Harvesting industrial hemp (Cannabis sativa) – this is a separate harvest for a different form of processing: The upper part of the plant with the leaves will be collected for cold pressing, while the lower part remains for producing fiber and initially it is left on the field. Hemp benefits crops grown after it. So, it is generally grown before winter cereals. Advantageous changes are high weed suppression, soil loosening by the large hemp root system, and the positive effect on soil tilth. Since hemp is very self-compatible, it can also be grown several years in a row in the same fields (monoculture). Hemp is considered by a 1998 study in Environmental Economics to be environmentally friendly due to a decrease of land use and other environmental impacts, indicating a possible decrease of ecological footprint in a US context compared to typical benchmarks. A 2010 study, however, that compared the production of paper specifically from hemp and eucalyptus concluded that “industrial hemp presents higher environmental impacts than eucalyptus paper”; however, the article also highlights that “there is scope for improving industrial hemp paper production”. Hemp is also claimed to require few pesticides and no herbicides, and it has been called a carbon negative raw material. Results indicate that high yield of hemp may require high total nutrient levels (field plus fertilizer nutrients) similar to a high yielding wheat crop. Air-dried stem yields in Ontario have from 1998 and onward ranged from 2.6–14.0 tonnes of dry, retted stalks per hectare (1–5.5 t/ac) at 12% moisture. Yields in Kent County, have averaged 8.75 t/ha (3.5 t/ac). Northern Ontario crops averaged 6.1 t/ha (2.5 t/ac) in 1998. Statistic for the European Union for 2008 to 2010 say that the average yield of hemp straw has varied between 6.3 and 7.3 ton per ha. Only a part of that is bast fiber. Around one tonne of bast fiber and 2–3 tonnes of core material can be decorticated from 3–4 tonnes of good-quality, dry-retted straw. For an annual yield of this level is it in Ontario recommended to add nitrogen (N):70–110 kg/ha, phosphate (P2O5): up to 80 kg/ha and potash (K2O): 40–90 kg/ha. The average yield of dry hemp stalks in Europe was 6 ton/ha (2.4 ton/ac) in 2001 and 2002. FAO argue that an optimum yield of hemp fiber is more than 2 tonnes per ha, while average yields are around 650 kg/ha. Queensland has allowed industrial production under licence since 2002, where the issuance is controlled under the Drugs Misuse Act 1986. New South Wales now issues licences under a law, the Hemp Industry Regulations Act 2008 (No 58), that came into effect as of 6 November 2008. Most recently, South Australia legalized industrial hemp under South Australia’s Industrial Hemp Act 2017, which commenced on 12 November 2017. Commercial production (including cultivation) of industrial hemp has been permitted in Canada since 1998 under licenses and authorization issued by Health Canada (9,725 ha in 2004, 5450 ha in 2009). France is Europe’s biggest producer (and the world’s second largest producer) with 8,000 hectares (20,000 acres) cultivated. 70–80% of the hemp fibre produced in 2003 was used for specialty pulp for cigarette papers and technical applications. About 15% was used in the automotive sector, and 5-6% was used for insulation mats. About 95% of hurds were used as animal bedding, while almost 5% was used in the building sector. In 2010/2011, a total of 11,000 hectares (27,000 acres) was cultivated with hemp in the EU, a decline compared with previous year. From the 1950s to the 1980s, the Soviet Union was the world’s largest producer of hemp (3,000 square kilometres (1,200 sq mi) in 1970). The main production areas were in Ukraine, the Kursk and Orel regions of Russia, and near the Polish border. Since its inception in 1931, the Hemp Breeding Department at the Institute of Bast Crops in Hlukhiv (Glukhov), Ukraine, has been one of the world’s largest centers for developing new hemp varieties, focusing on improving fiber quality, per-hectare yields, and low THC content. After the collapse of the Soviet Union, the commercial cultivation of hemp declined sharply. However, at least an estimated 2.5 million acres of hemp grow wild in the Russian Far East and Black Sea regions. Hemp was made illegal to grow without a permit in the U.S. under the Controlled Substances Act passed in 1970 because of its relation to marijuana, and any imported hemp products must meet a zero tolerance level. Some states have made the cultivation of industrial hemp legal, but farmers in many states have not yet begun to grow it because of resistance from the federal Drug Enforcement Administration, making “large-scale hemp growing” in the United States “not viable” as late as 2013. In 2013, after the legalization of cannabis in the state, several farmers in Colorado planted and harvested several acres of hemp, bringing in the first hemp crop in the United States in over half a century. Colorado, Vermont, California, and North Dakota have passed laws enabling hemp licensure. All four states are waiting for permission to grow hemp from the DEA. Currently, Oregon has licensed industrial hemp as of August 2009[update]. Congress included a provision in the Agricultural Act of 2014 that allowed colleges and state agencies to grow and conduct research on hemp in states where it is legal. Hemp production in Kentucky, formerly the United States’ leading producer, resumed in 2014. Hemp production in North Carolina resumed in 2017, and in Washington State the same year. By the end of 2017, at least 34 U.S. states had industrial hemp programs. In 2018, New York began taking strides in industrial hemp production, along with hemp research pilot programs at Cornell University, Binghamton University and SUNY Morrisville. As of 2015 the hemp industry estimated that annual sales of hemp products were around US$600 million annually; hemp seeds have been the major force driving this growth. Radical 200 (麻 or má), the Chinese character for hemp, depicts two plants under a shelter. The use of hemp in Taiwan dates back at least 10,000 years. 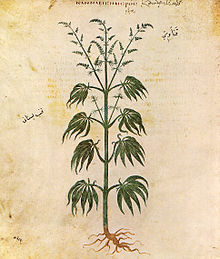 Jews living in Palestine in the 2nd century were familiar with the cultivation of hemp, as witnessed by a reference to it in the Mishna (Kil’ayim 2:5) as a variety of plant, along with Arum, that sometimes takes as many as three years to grow from a seedling. In late medieval Germany and Italy, hemp was employed in cooked dishes, as filling in pies and tortes, or boiled in a soup. Hemp in later Europe was mainly cultivated for its fibers, and was used for ropes on many ships, including those of Christopher Columbus. The use of hemp as a cloth was centered largely in the countryside, with higher quality textiles being available in the towns. Cannabis sativa from Vienna Dioscurides, 512 AD. The Spaniards brought hemp to the Americas and cultivated it in Chile starting about 1545. Similar attempts were made in Peru, Colombia, and Mexico, but only in Chile did the crop find success. In July 1605, Samuel Champlain reported the use of grass and hemp clothing by the (Wampanoag) people of Cape Cod and the (Nauset) people of Plymouth Bay told him they harvested hemp in their region where it grew wild to a height of 4 to 5 ft. In May 1607, “hempe” was among the crops Gabriel Archer observed being cultivated by the natives at the main Powhatan village, where Richmond, Virginia is now situated; and in 1613, Samuell Argall reported wild hemp “better than that in England” growing along the shores of the upper Potomac. As early as 1619, the first Virginia House of Burgesses passed an Act requiring all planters in Virginia to sow “both English and Indian” hemp on their plantations. The Puritans are first known to have cultivated hemp in New England in 1645. George Washington pushed for the growth of hemp and even grew hemp himself, as it was a cash crop commonly used to make rope and fabric. In May 1765 he noted in his diary about the sowing of seeds each day until mid-April. Then he recounts the harvest in October which he grew 27 bushels that year. There is some speculation that George Washington smoked the flower of the cannabis plant in order to achieve a recreational high (“Like all farmers, Washington probably sampled the quality and potency of what he grew, and he may have used this hemp to treat his chronic tooth aches”), but there is no evidence in any of his writings that he grew hemp for anything other than industrial purposes. It is sometimes supposed that an excerpt from Washington’s diary, which reads “Began to seperate [sic] the Male from the Female hemp at Do.&—rather too late” is evidence that he was trying to grow female plants for the THC found in the flowers. However, the editorial remark accompanying the diary states that “This may arise from their [the male] being coarser, and the stalks larger” In subsequent days, he describes soaking the hemp (to make the fibers usable) and harvesting the seeds, suggesting that he was growing hemp for industrial purposes, not recreational. Additional presidents known to have farmed hemp include Thomas Jefferson, James Madison, James Monroe, Andrew Jackson, Zachary Taylor, and Franklin Pierce. Historically, hemp production had made up a significant portion of antebellum Kentucky’s economy. Before the American Civil War, many slaves worked on plantations producing hemp. In 1937, the Marihuana Tax Act of 1937 was passed in the United States, levying a tax on anyone who dealt commercially in cannabis, hemp, or marijuana. The passing of the Act to destroy the US hemp industry has been disputed to involve businessmen Andrew Mellon, Randolph Hearst and the Du Pont family. Another claim is that Mellon, Secretary of the Treasury and the wealthiest man in America at that time, had invested heavily in DuPont‘s new synthetic fiber, nylon, and believed[dubious – discuss] that the replacement of the traditional resource, hemp, was integral to the new product’s success. The company DuPont and many industrial historians dispute a link between nylon and hemp, nylon became immediately a scarce commodity. [clarification needed] Nylon had characteristics that could be used for toothbrushes (sold from 1938) and very thin nylon fiber could compete with silk and rayon in various textiles normally not produced from hemp fiber, such as very thin stockings for women. Hemp was used extensively by the United States during World War II to make uniforms, canvas, and rope. Much of the hemp used was cultivated in Kentucky and the Midwest. 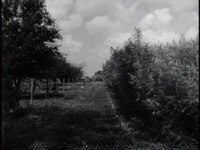 During World War II, the U.S. produced a short 1942 film, Hemp for Victory, promoting hemp as a necessary crop to win the war. 1942 United States Department of Agriculture War Board Letter of appreciation to Joe “Daddy Burt” Burton, a Kentucky hemp farmer for his support of the World War II Hemp for Victory campaign. United States “Marihuana” production permit. 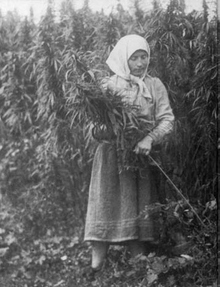 In the United States, hemp cultivation is legally prohibited, but during World War II farmers were encouraged to grow hemp for cordage, to replace Manila hemp previously obtained from Japanese-controlled areas. The U.S. government produced a film explaining the uses of hemp, called Hemp for Victory. In Japan, hemp was historically used as paper and a fiber crop. There is archaeological evidence cannabis was used for clothing and the seeds were eaten in Japan back to the Jōmon period (10,000 to 300 BC). Many Kimono designs portray hemp, or asa (Japanese: 麻), as a beautiful plant. In 1948, marijuana was restricted as a narcotic drug. The ban on marijuana imposed by the United States authorities was alien to Japanese culture, as the drug had never been widely used in Japan before. Though these laws against marijuana are some of the world’s strictest, allowing five years imprisonment for possession of the drug, they exempt hemp growers, whose crop is used to make robes for Buddhist monks and loincloths for Sumo wrestlers. Because marijuana use in Japan has doubled in the past decade, these exemptions have recently been called into question. The cultivation of hemp in Portuguese lands began around the fourteenth century onwards, it was raw material for the preparation of rope and plugs for the Portuguese ships. Colonies for factories for the production of flax hemp, such as the Royal Flax Hemp Factory in Brazil. In 1971, the cultivation of hemp became illegal, and the production was substantially reduced. Because of EU regulations 1308/70, 619/71 and 1164/89, this law was revoked (for some certified seed varieties). ^ “Hemp”. The Free Dictionary, Farlex, Inc. 2017. ^ Robert Deitch (2003). Hemp: American History Revisited: The Plant with a Divided History. Algora Publishing. p. 219. ISBN 978-0-87586-226-2. ^ a b Swanson 2015, p. 602. ^ Talbot, Geoff (2015). Specialty Oils and Fats in Food and Nutrition: Properties, Processing and Applications. Elsevier Science. p. 39. ISBN 978-1-78242-397-3. ^ Crime, United Nations Office on Drugs and (2009). Recommended Methods for the Identification and Analysis of Cannabis and Cannabis Products: Manual for Use by National Drug Testing Laboratories. United Nations Publications. p. 12. ISBN 978-92-1-148242-3. ^ “America’s First Hemp Drink – Chronic Ice – Making a Splash in the Natural Beverage Market”. San Francisco Chronicle. Los Angeles. Vocus. 8 June 2011. Archived from the original on 27 December 2011. Retrieved 19 June 2011. ^ a b c “USDA ERS – Industrial Hemp in the United States: Status and Market Potential” (PDF). Ers.usda.gov. Retrieved 2013-11-09. ^ “New York Chefs are Going Nuts for…Hemp Leaves?!”. rachaelraymag.com. Retrieved 2018-12-18. ^ a b c “Farm bill promotes hemp as legal crop”. Leg.state.or.us. Retrieved 2014-02-05. ^ a b “Nutrition Facts for Hemp Seeds (shelled) per 100 g serving”. Conde Nast, Custom Analysis. 2014. Retrieved 19 February 2015. ^ a b Callaway, J. C. (2004-01-01). “Hempseed as a nutritional resource: An overview” (PDF). Euphytica. 140 (1–2): 65–72. doi:10.1007/s10681-004-4811-6. Retrieved 2013-03-13. ^ “HempMy Pet FAQs”. Retrieved 2018-12-18. ^ “CRRH, Archaeologists agree that cannabis was among the first crops cultivated by human beings at least over 6,000 years ago, and perhaps more than 12,000 years ago”. Crrh.org. Retrieved 2011-04-20. ^ “Online Etymology Dictionary”. Etymonline.com. Retrieved 2011-04-20. Cronin, Mary Elizabeth (1995-02-11). “Hemp fashions are clean, comfy, and legal”. The Free Lance-Star. ^ “Why Build with Hemp? Properties of Hemp-Lime”. OldBuilders. Retrieved 20 September 2018. ^ Isabelle, Ceyte (2008). Etat, acteurs privés et innovation dans le domaine des matériaux de construction écologiques : Le développement du béton de chanvre depuis 1986 (PDF) (MASTER – Politiques publiques et gouvernements comparés thesis) (in French). ‘Institut d’Etudes Politiques de Lyon. ^ “The Haverhill Hemp Houses”. bre.co.uk. Retrieved 2013-02-08. ^ “Modece Architects”. modece.com. Retrieved 2013-02-08. ^ “The NNFCC Renewable House”. Renewable-house.co.uk. Retrieved 2011-04-20. ^ “Hemp homes are cutting edge of green building”. USA Today. 2010-09-12. ^ “HEMPSEC project website”. European Union research. Retrieved 8 July 2014. ^ Allin, Steve. Building with Hemp, Seed Press, 2012, ISBN 978-0-9551109-1-7. (p. 95, 2nd Edition). ^ “Thermoformable Composite Panels” (PDF). Composites World. 2006. ^ “Plastics”. hemp.com. 2013-05-14. Retrieved 2013-11-09. ^ “Lotus announces hemp-based Eco Elise: a new type of ‘green’ car”. transport20.com. Retrieved 2013-11-09. ^ “Green Cars, Fuel Efficiency and the Environment | Mercedes-Benz”. Mbusa.com. Retrieved 2013-11-09. ^ “Michael Karus:European hemp industry 2001 till 2004: Cultivation, raw materials, products and trends, 2005” (PDF). Retrieved 2011-04-20. ^ Paulapuro, Hannu (2000). “5”. Paper and Board grades. Papermaking Science and Technology. 18. Finland: Fapet Oy. p. 114. ISBN 978-952-5216-18-9. ^ Van Roekel; Gerjan J. (1994). “Hemp Pulp and Paper Production”. Journal of the International Hemp Association. ^ Schubert, Pit. “Our ropes are much stronger than we believe”. Union Internationale Des Associations D’Alpinisme. Archived from the original on September 27, 2007. ^ “Phytoremediation: Using Plants to Clean Soil”. Mhhe.com. Retrieved 2011-04-20. ^ “Hemp As Weed Control”. gametec.com. Retrieved 2008-07-09. ^ Reisinger, Péter; Lehoczky, Éva; Komives, Tamas (2005-03-01). “Competitiveness and Precision Management of the Noxious Weed Cannabis sativa L. in Winter Wheat”. Communications in Soil Science and Plant Analysis. 36 (4–6): 629–634. doi:10.1081/CSS-200043303. ISSN 0010-3624. ^ “COOLFUEL Episode: Sugarcane and Hempoline”. Retrieved 2009-10-16. ^ “Clean Energy Solutions”. Hemp 4 Fuel. Retrieved 2011-04-20. ^ “Pollution: Petrol vs. Hemp”. Hempcar.org. Archived from the original on 2006-07-20. Retrieved 2011-04-20. ^ “Biofuels Facts”. Hempcar.org. Archived from the original on 2011-05-20. Retrieved 2011-04-20. ^ “Increased biogas production at the Henriksdals Waste Water plant, Cajsa Hellstedt et. all, June 2010” (PDF). ^ a b This paper begins with a history of hemp use and then describes how hemp was constructed as a dangerous crop in the U.S. The paper then discusses the potential of hemp as an alternative crop. Luginbuhl, April M. (2001). “Industrial hemp (Cannabis sativa L): The geography of a controversial plant” (PDF). The California Geographer. 41. California Geographical Society. pp. 1–14. hdl:10211.2/2738. Retrieved 2013-03-28. Hemp contains less than 1% THC, or tetrahydrocannabinols, the psychoactive property in marijuana. In other words, smoking hemp cannot create a ‘high.’ … The dense growth of hemp eliminates other weeds…. The best growing technique for hemp, planting 300 to 500 plants per square meter, also helps authorities easily tell the hemp from marijuana, which is a plant that is less densely cultivated. (Roulac 1997; 149). ^ a b Deitch, Robert (2003). Hemp: American History Revisited: The Plant with a Divided History. Algora Publishing. pp. 4–26. ISBN 9780875862262. Retrieved 2013-11-16. Cannabis is … a plant that played an important role in colonial America’s prosperous economy and remained a valuable commercial commodity up until the Second World War. ^ “Industrial Hemp Production and Management”. Province of Manitoba: Manitoba Agriculture. Retrieved January 8, 2019. ^ a b Sawler, J; Stout, J. M; Gardner, K. M; Hudson, D; Vidmar, J; Butler, L; Page, J. E; Myles, S (2015). “The Genetic Structure of Marijuana and Hemp”. PLOS One. 10 (8): e0133292. Bibcode:2015PLoSO..1033292S. doi:10.1371/journal.pone.0133292. PMC 4550350. PMID 26308334. ^ Elsohly, M. A; Radwan, M. M; Gul, W; Chandra, S; Galal, A (2017). Phytochemistry of Cannabis sativa L. Progress in the Chemistry of Organic Natural Products. 103. pp. 1–36. doi:10.1007/978-3-319-45541-9_1. ISBN 978-3-319-45539-6. PMID 28120229. ^ Datwyler, SL; Weiblen, GD (2006). “Genetic Variation in Hemp and marijuana (Cannabis sativa L.) sativa plants are taller and less dense. 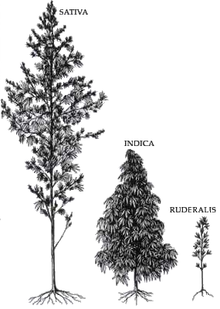 Indica plants are shorter but a lot more dense than sativas. According to Amplified Fragment Length Polymorphisms”. Journal of Forensic Sciences. 51 (2): 371–375. doi:10.1111/j.1556-4029.2006.00061.x. PMID 16566773. ^ Common, Michael; Stagl, Sigrid; Gay, Philip W. (1998-06-30). “Industrial hemp’s double dividend: a study for the USA”. Ecological Economics. 25 (3): 291–301. Bibcode:2005ecec.book…..C. CiteSeerX 10.1.1.603.9935. doi:10.1016/S0921-8009(97)00040-2. Retrieved 2013-11-09. ^ Da Silva Vieira, Ricardo; Canaveira, Paulo; Da Simões, Ana; Domingos, Tiago (2010). “Industrial hemp or eucalyptus paper?”. The International Journal of Life Cycle Assessment. 15 (4): 368–375. doi:10.1007/s11367-010-0152-y. “FAQs & Facts: Facts”. Resources: Education. The HIA. Retrieved 2008-07-05. “HIA: Resources: Education: FAQs & Facts: FAQs: Answers”. thehia.org. Retrieved 2008-07-05. ^ “D. Risula, and others, Saskatchewan Ministry of Agriculture, October 2009”. Retrieved 2011-04-20. ^ “Lawmakers legalize industrial hemp farming in Greece: Prospects & Opportunities”. Tekmon Geomatics. Retrieved 2017-02-05. ^ “Hemp vs. Marijuana”. azhemp.org. Retrieved 2008-06-18. ^ “Hemp Facts”. thehia.org. Retrieved 2013-11-09. ^ Carus, Michael (June 2013). “The European Hemp Industry: Cultivation, processing and applications for fibres, shivs and seeds” (PDF). European Industrial Hemp Association. Retrieved 2016-08-30. ^ a b “Agriculture in the European Union, Statistical and Economic Information 2011, European Union Directorate-General for Agriculture and Rural Development, page 283” (PDF). Retrieved 2013-11-09. ^ “Growing Industrial Hemp in Ontario, Ministry of Agriculture, Food and Rural Affairs, Canada, 2008”. ON, CA: Omafra. Retrieved 2011-04-20. ^ Graeme Thomas. “Natural Fibers: Hemp Food and Agriculture Organization of the United Nations, 2009”. Naturalfibres2009.org. Retrieved 2011-04-20. “Drugs, Poisons and Controlled Substances (Industrial Hemp) Regulations 2008” (PDF). dms.dpc.vic.gov.au. Retrieved 2008-11-24. ^ “Guidelines for engaging in the commercial production of industrial hemp in Queensland”. dpi.qld.gov.au. Archived from the original on December 20, 2008. Retrieved 2008-11-24. “Drugs Misuse Act 1986” (PDF). legislation.qld.gov.au. Retrieved 2008-11-24. “Opportunities to engage in commercial low THC hemp fibre and seed production in NSW”. dpi.nsw.gov.au. Retrieved 2008-11-24. “Hemp Industry Regulation 2008”. legislation.nsw.gov.a. Retrieved 2008-11-24. ^ “Government of Alberta: Industrial Hemp Production in Canada, February 2, 2010”. .agric.gov.ab.ca. Retrieved 2011-04-20. ^ “Where the heck is hemp?, The Alberta Express, April 18th, 2007”. www.hempline.com. ^ “Manitoba Harvest 2007 Peoples Choice, Eco Libris, Oct 8th, 2007”. ecolibris.blogspot.ca/. ^ a b Mark Halsall (2 March 2018). “Hemp area may stall in 2018”. CountryGuide, Glacier FarmMedia Limited Partnership. Retrieved 18 May 2018. ^ “Hemp: a plant still unknown (in French)”. Jardinage. 4 October 2014. Retrieved 25 June 2018. ^ “Hemp research and growing in Ukraine”. Aginukraine.com. 2002-01-06. Retrieved 2011-04-20. ^ “(Website/ Products)”. Retrieved September 28, 2011. ^ Jon Merrills; Jonathan Fisher (2013). Pharmacy Law and Practice. Academic Press. p. 227. ISBN 978-0-12-394618-8. ^ Frank J. House (2006). Agricultural Programs, Terms and Laws. Nova Publishers. p. 146. ISBN 978-1-59454-892-5. ^ Legislatures, National Conference of State. “State Industrial Hemp Statutes”. www.ncsl.org. ^ Juliet Eilperin (February 11, 2013), “‘Good seed’ versus ‘evil weed’: Hemp activists eye legalization”, The Washington Post – via The Japan Times Online, [A] couple of factors — the high taxes the federal government imposed on growing hemp in the late 1930s and again in the early ’50s, and then the DEA’s interpretation of the 1970 law — made producing hemp nearly impossible. Since the DEA only grants permits in rare instances and demands costly, elaborate security precautions, large-scale hemp growing in the United States is not viable. ^ “Hemp, hemp, hooray: Bill aims to aid farmers with new but controversial crop”. Minnesotaindependent.com. Retrieved 2011-04-20. ^ “75th Oregon Legislative Assembly – 2009 Regular Session Senate Bill 676”. Leg.state.or.us. Retrieved 2011-04-20. ^ “New York farmers eyeing big benefits from growing hemp that doesn’t get you high”. Pressconnects. Retrieved 2018-05-30. ^ Johnson, Renée (2017-03-10). “Hemp as an Agricultural Commodity” (PDF). Congressional Research Service. Retrieved 2018-01-28. ^ Chhabra, Esha. “Why Hemp Is Still Controversial In America And A Challenge For Entrepreneurs”. Forbes. Retrieved 2016-08-31. ^ a b Lunsford, Mackensy (2018-12-21). “Trump signs farm bill making hemp federally legal, boosting promising NC cash crop”. Asheville Citizen-Times. Retrieved 2018-12-22. ^ Fritze, John; Jackson, David (2018-12-20). “Trump recalls the time he sang ‘Green Acres’ theme song as he prepares to sign farm bill”. Asheville Citizen-Times. Retrieved 2018-12-22 – via USA Today. ^ a b c Stafford, Peter (1992). Psychedelics Encyclopedia. Berkeley, CA, USA: Ronin Publishing. ISBN 978-0-914171-51-5. “Information paper on industrial hemp (industrial cannabis)”. Department of Primary Industries and Fisheries, Queensland Government. Archived from the original on 2008-07-23. Retrieved 2008-07-05. ^ Ethan Russo (August 2007). “History of cannabis and its preparations in saga, science, and sobriquet”. Chemistry & Biodiversity. 4 (8): 1614–1648. doi:10.1002/cbdv.200790144. PMID 17712811. ^ Tengwen Long; et al. (March 2017). “Cannabis in Eurasia: origin of human use and Bronze Age trans-continental connections”. Vegetation History and Archaeobotany. 26 (2): 245–258. doi:10.1007/s00334-016-0579-6. ^ Barber, E. J. W. (1992). Prehistoric Textiles: The Development of Cloth in the Neolithic and Bronze Ages with Special Reference to the Aegean. Princeton University Press. p. 17. ^ Herodotus. Histories. IV. 73–75. ^ Barber, E. J. W. (1992). Prehistoric Textiles: The Development of Cloth in the Neolithic and Bronze Ages with Special Reference to the Aegean. Princeton University Press. p. 18. ^ Barber (1992). p. 19. Daryl T. Ehrensing (May 1998). “Feasibility of Industrial Hemp Production in the United States Pacific Northwest, SB681”. Oregon State University. Retrieved May 15, 2016. ^ Champlain, Samuel, Henry P. Biggar. 1929. The Works of Samuel de Champlain, vol 1. Toronto: Champlain Society. pp. 341–56. ^ Gabriel Archer, A Relatyon of the Discoverie of Our River…, printed in Archaeologia Americana 1860, p. 44. William Strachey (1612) records a native (Powhatan) name for hemp (weihkippeis). ^ “Diary of George Washington, entry 7 August 1765”. founders.archives.gov. Retrieved 2014-06-03. ^ “Diary of George Washington, entry 22 August 1765”. founders.archives.gov. Retrieved 2014-06-03. ^ “Diary of George Washington, entry September 1765”. founders.archives.gov. Retrieved 2014-06-03. ^ Bear, James A. Jr., and Lucia C. Stanton, eds. Jefferson’s Memorandum Books: Accounts, with Legal Records and Miscellany, 1767–1826. Princeton, NJ: Princeton University Press, 1997, 1:383. ^ a b c Dewey LH (1943). Fiber production in the western hemisphere. United States Printing Office, Washington. p. 67. Retrieved 25 February 2015. ^ Rowe, Thomas C (2006). Federal narcotics laws and the war on drugs: money down a rat hole. Psychology Press. p. 26. ISBN 978-0-7890-2808-2. ^ Sullivan, Larry E; et al., eds. (2005). Encyclopedia of Law Enforcement: Federal. SAGE. p. 747. ISBN 978-0-7619-2649-8. ^ Lusane, Clarence (1991). Pipe dream blues: racism and the war on drugs. South End Press. pp. 37–8. ISBN 978-0-89608-410-0. ^ “the history of nylon”. caimateriali.org. ^ Wolfe, Audra J. (2008). “Nylon: A Revolution in Textiles”. Chemical Heritage Magazine. 26 (3). Retrieved 20 March 2018. ^ “American Chemical Society: THE FIRST NYLON PLANT. 1995” (PDF). acs.org. ^ “Who invented the toothbrush and when was it? (Everyday Mysteries: Fun Science Facts from the Library of Congress)”. loc.gov. ^ Armagnac, Alden P. (1943). “Plant Wizards Fight Wartime Drug Peril” (September): 62–63. ^ Bradshaw, R. H. W.; Coxon, P.; Greig, J. R. A.; Hall, A. R. (1981). “New Fossil Evidence for the Past Cultivation and Processing of Hemp (Cannabis sativa L.) in Eastern England”. The New Phytologist. 89 (3): 503–510. doi:10.1111/j.1469-8137.1981.tb02331.x. JSTOR 2434380. ^ “Dr. Ivan BÛcsa, GATE Agricultural Research Institute, Kompolt – Hungary, Book Review Re-discovery of the Crop Plant Cannabis Marihuana Hemp (Die Wiederentdeckung der Nutzplanze Cannabis Marihuana Hanf)”. Hempfood.com. Archived from the original on 2012-12-21. Retrieved 2011-04-20. ^ Lynn Robins; et al. (July 2013). “Economic Considerations for Growing Industrial Hemp:Implications for Kentucky’s Farmers and Agricultural Economy” (PDF). Department of Agricultural Economics, University of Kentucky. ^ Yuka Hayashi (2009-03-04). “In Drug-Leery Japan, Arrests for Marijuana Are on the Rise”. Wall Street Journal. ^ “Commission Regulation (EC) No 605/98 of 17 March 1998 amending Regulation (EEC) No 1164/89 laying down detailed rules concerning the aid for fibre flax and hemp”. October 2015. “Hemp” . New International Encyclopedia. 1905.